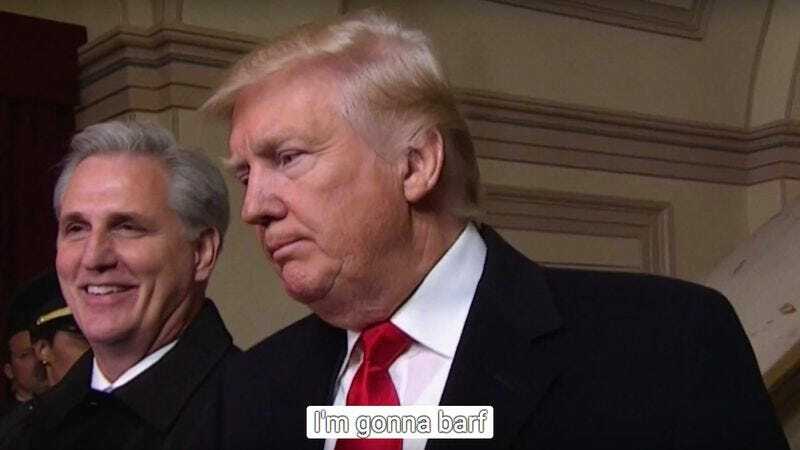 In addition to Trump himself, Melania Trump, the Obamas, Hillary Clinton, George W. Bush, Clarence Thomas, Mike Pence, and John Roberts also get the lip-reading treatment. While the nonsensical swearing-in ceremony and speeches are funny, the best through-line is the thinly veiled anger that lurks beneath every friendly interaction between Trump and Obama. For instance, while cordially shaking hands at the podium, Trump explains, “Now I pretend I like you, but I hate you inside,” to which Obama responds, “You’re a creep.” The video also has the genius idea to remove the music from the ceremonial first presidential dance, making the whole thing as unpleasant as America feels right now.